Even if the paperless offi ce is a big goal for a lot of users, one does require some information for documentation on paper as always. Outlook cannot decide by itself as to which emails it should print. By means of rules, you can instruct Outlook to automatically send certain incoming emails to the printer. At this point, you can also define criteria that make decisions about a printout. 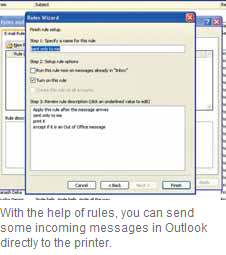 To define these rules, open “Inbox” and click the “Start” tab in the “Move” to “Rules” as well as to “Manage Rules and Alerts” in the next menu in the multi-function bar of newer Outlook versions like 2007 and 2010. In older versions of Outlook, open the “Tools | Rules and Alerts” menu command. Then click “New rule” to start the rule wizard. Select the “Apply rule to received messages” entry under “Create rule without template” and click “Next”. On the next page, define the conditions that an incoming message must fulfill to execute this rule. You can thus apply the rule only to messages that are exclusively addressed to you by activating the option “that’s has been sent only to me”. Confirm your selection with “Next”. If Outlook has to apply the rule to all incoming messages, use “Next” without activating any other options before. You will however have to re-confirm this in a separate dialog. On the next page, you determine what should be done with the respective message. To directly send it to the printer, activate “print this”. You can also define additional actions. Then confirm with “Next”. You still have the option to state exceptions. For example, you can forego printing automatic replies by inserting a tick mark against “except it is an automatic reply”. Click “Next”. On the next page of the wizard, give a corresponding name to the rule under “1st step: Enter rule name”, e.g. “Print message immediately”. Click “Complete” to create it. Note that a tick mark has been inserted in front of the option “Activate this rule”. NOTE: It is absolutely recommended to define conditions and exceptions for the rule to prevent the unnecessary automatic printing of all emails and the resultant wastage of paper. Moreover, you should move a printed message from the “Inbox” to another folder with the help of an additional action so as to keep a track of it.